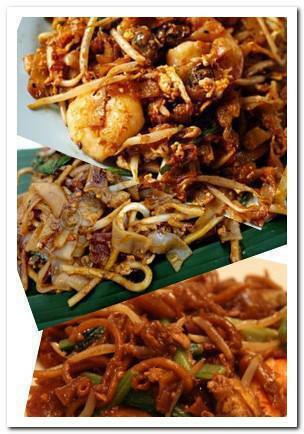 Char Kway Teow - fried flat rice noodles, is a popular noodle dish in Malaysia and Singapore. Flat rice noodles are approximately 1 cm or slightly narrower in width. Flat rice noodles stir-fried with light and dark soy sauce over high heat, and other ingredients include prawns, cockles, eggs, bean sprouts and Chinese chives. Sambal chili may be added to enhance the flavor and it is favored by the people who enjoy spicy food. Mix all seasoning ingredients. Put aside. Heat oil with high heat in a large wok or pan. Add prawns, fish cake (or sausage) and garlic, cook until garlic fragrant. Push everything to the side, add chili paste (if using), stir-fry for 30 seconds, add in the noodles and stir everything together. Add seasoning mixture and stir-fry until everything mix well. Cook for few more minutes. Push everything to the side, add eggs at empty space, scrambling for a few seconds and mix with everything. Add bean sprout and stir and toss everything together until mixed well. Cook for 2 or 3 more minutes.